Which faces do Ivy/Counsel use in the minibuffer? Which faces are being applied to the indicated text, i.e. the strings 3114, M-x, and C-x C-c, in the following screenshot? I am using the packages Ivy and Counsel, in case that is relevant. 3114 M-x is propertised with the minibuffer-prompt face, as lawlist correctly guessed in a comment. C-x C-c (excluding surrounding parentheses) is propertised with the font-lock-keyword-face face by the function counsel-M-x-transformer. Not the answer you're looking for? Browse other questions tagged faces minibuffer ivy or ask your own question. What is causing background colors to blend? 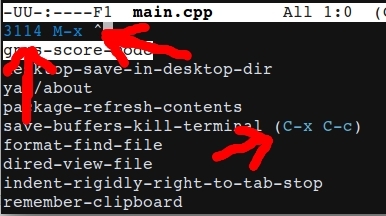 How to switch between Ivy completion styles? What is the variable for having multiple minibuffers?